Quiz Bird Revealed/La Respuesta del Prueba! Thanks to new member Jo Davidson for her photo of a female Blue-black Grassquit! Our contest had four entries — all wrong, so we are eating the cookies ourselves and hoping for better results next time. Entrant #4 threw caution to the wind calling our grassquit a Bobolink. Bobolinks are quite a bit bigger than grassquits although I will happily admit discerning size in a photograph is often more difficult than in the field and all our contestant had to go on here for comparison were some leaves. Gracias a nuestra miembre nueva Jo Davidson para su foto de una hembra Volatinia jacarina! Todos los respuestos estaban incorrectos, entonces vamos a comer las galletas yo mismo y esperar una resultada mejor proximo vez: jajaja! 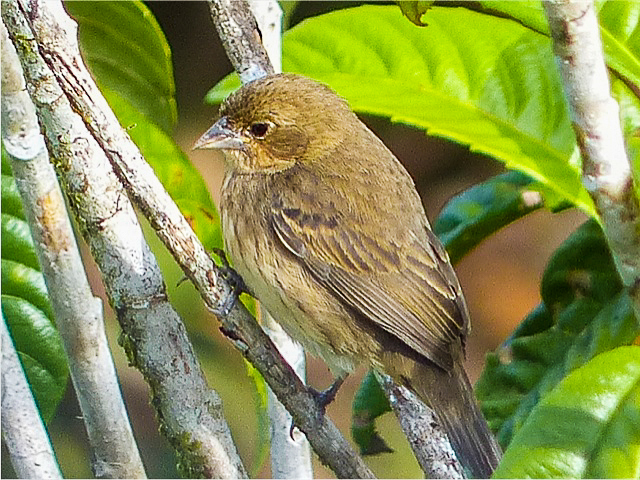 This entry was posted in Special Events and tagged Birding San Vito, Blue-black Grassquit, costa rica, Quiz Bird Contest by AWOlivieri. Bookmark the permalink.